Discover one of the most famous blue marlin fishing spots in the world. The Cape Verde islands in the Atlantic Ocean are located 600 km off the west coast of Senegal in West Africa. Turquoise waters, ideal sea temperatures between 23 and 26 degrees Celcius, and one of the world’s top ten coral reef biodiversity hotspots, all make this archipelago a unique place on earth. You can reserve your boat from March to December. Cape Verde is a year-round fishing spot and during the peak season, from March to July, it is not uncommon to have more than fifteen bites from blues per day ! 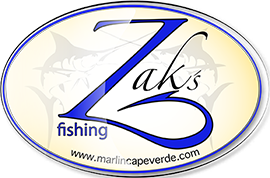 Besides the blue marlin there are yellow fin tuna, white marlin, sailfish, wahoo, dorado,and you can even try your luck with several different shark species. Your fishing dreams become reality ! Skipper Pape Mbengue is a Senegalese fisherman with over 25 years of fishing experience in Senegalese waters fishing for all kinds of big game. He comes from several generations of fishermen, and his knowledge of the sea is as instinctive as breathing. In addition, he has also been trained by the famous Zak Condé and Samir Rahal to provide you with the best fishing experience. Don't wait any longer to book your trip !